Westerfield Bowls Club was founded in 1928. Since its inception, there has been no break in its existence, even during the war. There have been difficult periods but the efforts of members have kept the spirit alive. The Bowls Club has two teams at present, Blue and Yellow, they play in three leagues every week during the summer, they enjoy their fair share of success, also disappointments, as in any sport. The playing season begins towards the end of April each year, ending mid to late September, depending on the weather. Club competitions are held each season, as well as other events, including a Club Coffee Morning. Most Saturday afternoons are club afternoons, anyone would be welcome to go along and have a go. 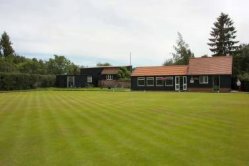 The Bowls Club Green and lovely new Club House (thanks to the efforts of members, both with the building of it and in raising funds) are situated behind the Church and the Village Hall. This is a very peaceful setting. During the winter months some of the members run Whist Drives (to which non-members are welcome) these are held in the Village Hall. These are advertised in the local Westerfield, Witnesham and Tuddenham News. The proceeds from these go towards the club funds. Members coming to the club are able to use the car park adjoining the paddock and village hall.